Advanced trigger modes including Edge, Video, Pulse Width,? The 1000 Series from RIGOL include the B, D, and E series oscilloscopes. The E Series are the value leader with 50-100 MHz models that include 2 channels and 1 Million points of memory. The D Series add low speed digital capture enabling basic mixed signal analysis in a economic package. The B Series provide more speed and power including our economic 4 channel, 200 MHz DS1204B model which provides 2 GSa/sec sampling. With features including FFTs, record and replay, roll mode, alternate trigger mode, and adjustable trigger sensitivity the 1000 Series is a great entry for value oscilloscope requirements. Never miss a transition or glitch with 1 to 2 GSa/sec sampling. Sample Rate describes the?frequency at which the instrument samples the data. Higher the sample rate provides better resolution and finer detail of the?signal being captured. The display capability provides resolution and clarity to capture signals with an entry level digital oscilloscope.? The 1000D and 1000E oscilloscopes provide 1 Million points of memory in a single waveform while the 1000B series provides up to 16,000 points. Memory depth enables more complete analysis of complex and longer waveforms. 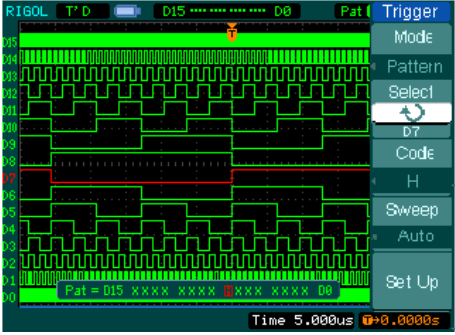 Trigger modes including edge, pulse width, slope, video, pattern, continuous time, and alternate Advanced trigger modes speed debugging and analysis. Alternating trigger mode is especially useful for non time correlated signals. With advanced trigger capabilities for an entry level oscilloscope analyze pulses, video, digital, and non-correlated signals with dedicated trigger modes. PVP2000 series Passive Probe with 1x:10x selector. Wide bandwidth of 35 MHz in 1x mode. One for each channel. Logic head for digital channel measurements. DS1000D Series models ONLY. Cable connecting logic probe to instrument. DS1000D Series ONLY. logic clips and wires for digital channel measurements. DS1000D Series models ONLY. Rack Mounting Kit for a DS1000B scopes. May be different than image. Rack kits may look different than picture.